A reusable Magnetic Storage medium. The Floppy Disk was our primary method of distributing personal computer data & software until CD-ROMs became the preferred Transportable Storage medium . Floppy Disks used today are rigid 3.5" microfloppies holding 1.44MB. The first varieties of 'Floppies' were housed in bendable jackets thus the name, Floppy Disk. Floppies are grossly undersized for today's use with an uncertain future. Also called a "Diskette," the Floppy is a flexible circle of magnetic material similar to magnetic tape, except both surfaces are used for Data Recording. The Floppy Drive grabs the Floppy's center and spins it inside its housing. Floppy read/write heads contact the surface through an opening in the plastic shell or envelope. Floppies spin at 300 RPM, as compared to an ATA/ATAPI Hard Disk of 7,200 RPM or a high performance SCSI HDD spinning @ 15,000 RPM. Floppies are also 'at rest' until a Data transfer is requested. 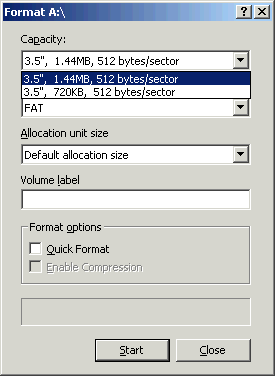 FAT12 is the only format used on floppy diskettes! Expect the floppy to disappear when CD Mount Rainier Rewrite (CD-MRW) Technology takes over! And Iomega came out with a Zip750 Magnetic Storage? Iomega is way out of touch with Reality & Technology! What were they thinking? Internal Flash Media Readers - Floppy Disk Replacement? Why not - They're 'IPL (Initial Program Load) Bootable' Devices on newer PC MotherBoards! Try loading drivers during an install - NOT! Still searching for a floppy! Hello Microsoft? Can we get a fix on this too? Sure - By Design. 299538 - A List of the Network Adapters That Are Supported by the Remote Boot Floppy Utility: Rbfg.exe utility - Windows Server 2003 (6/30/2003). 811839 - An I-O Device Error May Occur When You Access the Floppy Disk Drive in Windows XP Service Pack 1: (6/30/2003). 331961 - Data That Is Not Valid Is Copied from a USB Floppy Disk Drive If the PAE Option Is Used: Starting a Computer with 4 GB or more of RAM, two kilobytes (KB) or more data cannot be read correctly from Universal Serial Bus (USB) floppy disk drive. USB host controller does not allocate memory for data transfer. Windows 2000 Advanced Server - Problem corrected with SP4 (6/30/2003). 1.44 megabyte (MB) 3.5" floppy disk (read, write, format). 720 kilobyte (KB) 3.5" floppy disk (read, write only). 1.2MB 5.25" floppy disk (read, write only). 360KB 5.25" floppy disk (read, write only). 321697 - You Cannot Make Floppy Disk Controller Physically Probe Floppy Drives: Fdc.sys module error... Win2000 & WinXP (12/15/2003). www.microsoft.com - Enumerate Floppy Drives: NT 4, Win2000, WinXP & Server 2003 (12/15/2003). 131690 - Troubleshooting Floppy Disk Drive Problems in Windows: Win9x (12/15/2003). 198269 - Incorrect Floppy Drive Available on the Send To Command: Win9x (12/15/2003). www.microsoft.com - Eliminating Phantom Floppy Disk Drives under Windows 95-98-Me: BIOS Int 11 and Int 13 Implementation Guidelines - Programmers Guide (12/15/2003). www.microsoft.com - Boot up without the floppy drive to save time: WinMe fast Boot Up - From Device Manager, Floppy Disk tab - Clear option to Search for new floppy disk drives each time your computer starts. OmniFlop - A �universal� floppy disk reader, writer, and tester for the IBM PC or compatible which can handle alien floppy disk formats not normally supported by DOS, Windows and Linux. Supports over 250 floppy disk formats! 32-bit and 64-bit version of OmniFlop. - OmniFlop will not work with external USB floppy drive. - OmniFlop will not work with software simulations of hardware (e.g. VMware, VFD). Floppy Cable could be connected backward. Check red stripe on cable connected to pin#1 on floppy and the twisted end is towards the floppy. Think, "Red, Power To Pin 1"
Floppy Cable is loose. Try reseating the Floppy Cable. Power Connector is loose or not connected to the Floppy Drive. Floppy Controller Support for 5.25 inch Disk Drives. Note: Dual Floppy Disk Drive Controllers disappeared from MotherBoards in 2005. Single Drive Floppy Disk Controllers (still supporting both 3.5 inch & 5.25 inch Drives) disappeared, from most but not all, MotherBoards in 2009. Diskette Table originally prepared by Tom Lassiter.